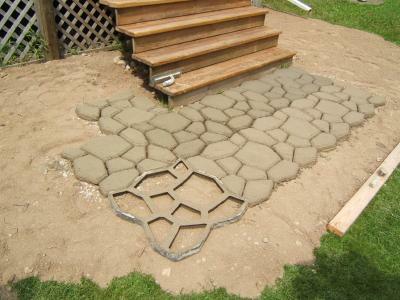 Using a mold to make concrete pavers is a fun and easy way to create your own unique walkway or patio. Installing pavers takes a bit of time and effort, but the results beautify the landscape while adding useful features. Why Use a Mold to Make Concrete Pavers? In today's world of big box home and garden stores and smaller specialty garden centers, you may wonder why using a mold to make concrete pavers is better than buying ready-made pavers. Concrete paver molds come in many sizes and shapes. You can find rectangles, squares, and octagons among other shapes. You can choose the type of concrete or other mortar to make the stones, and even add coloring agents to the mortar to change it from gray to any color under the sun. Adding rocks, pebbles, or colored stones can also add interest and variety. All of these additions and choices add up to garden paths lined with concrete pavers that are as unique as you are and add your own personal stamp to the garden. While you can certainly choose interesting and beautiful ready-made concrete pavers, making your own adds a creative dimension that appeals to many gardeners. The most likely place to use concrete pavers is the garden pathway. Choosing pavers for walkways adds an elegant touch to garden pathways. Depending on what sizes, shapes and colors of stepping stones and pavers you choose, you can add an air of formality or country charm to the garden path. Concrete molds can also be used for larger areas. Many people are turning to paver molds to create floors for patio areas. Rather than fussing with laying large blocks of stone, they're using the molds to make beautiful patterned areas for outdoor entertaining. Some gardeners may be intimidated at the thought of making their own concrete pavers. The process is simple. If you can make a cake, you can make concrete pavers and stepping stones. Here are some helpful hints for using molds to make stones and pavers. Choose an overcast day if you can, but don't work with concrete if rain threatens. Rain on newly poured concrete dilutes it too much and can prevent it from hardening. Similarly, a hot sunny day may make it harden too quickly. Overcast days also make it cooler for you to work outside. Select molds that add to the garden theme. With so many molds to choose from, you're bound to find one that matches your garden. Since adding stones and pavers takes time and effort, and the results aren't easily moved once they're installed, take your time to select the right look and feel for your garden. Rinse tools thoroughly before concrete hardens on them. They should rinse clean. Always rinse them away from garden areas and lawns. The Mold Store carries a wide variety of molds to make pavers, stepping stones, bricks and more. They include simple do-it-yourself instructions on how to cast pavers using their molds right on the home page. Gecko Stone provides funky, artsy molds. Some look like puzzle pieces, while other provide abstract patterns. Mold Creations features more traditional styles, including some that mimic bricks. Concrete Success features a wide variety of mold shapes to create interlocking patio stones as well as stones for garden paths. Whatever mold you choose, have fun. You're an artist, and your canvas is your garden. Paint a bold, beautiful picture using stones and pavers that is uniquely you.